The Star Tribune recently recognized the Hillstrom Museum of Art at Gustavus Adolphus College as the “best unexpected place to find great art” in its recently released Best of Minnesota 2014 special section. The Best of Minnesota listings were thoughtfully selected by the 265 Star Tribune journalists who comprise Minnesota’s largest newsroom. The complete Best of Minnesota listings can be found in the Sunday, May 18 print edition of the Star Tribune. The Hillstrom Museum of Art was established in 2000 and is the principal venue for the exhibition of art at Gustavus. The Museum serves not only the students, faculty, administrators, and staff of the College, but also those residing in the region and anyone who wishes to visit. The Museum is named for the Rev. Richard L. Hillstrom, a 1938 graduate of the College, who began acquiring art in the 1940s, when his ministerial career was just beginning. Rev. Hillstrom has been an ardent supporter of Gustavus and the Hillstrom Museum of Art, and his many donations include the majority of his extensive and impressive collection of art works—which form the core of the Museum’s collection—as well as very generous financial support for the Museum. In his collecting, Hillstrom initially concentrated on Swedish-American artists, such as Birger Sandzén (1871-1954), the widely recognized Kansas painter who had studied with Swedish artist Anders Zorn (1860-1920) before coming to America, or Minnesota-based artist Elof Wedin (1901-1983), with whom Hillstrom was personally acquainted. Soon he branched out in other directions, focusing on nationally known artists especially of the American figural tradition from the first half of the twentieth century. He acquired pieces by The Eight, a group of artists dedicated to making art connect directly with life. Painter Robert Henri (1865-1929) was the spiritual leader of this group, whose other members included Arthur B. Davies (1862-1928), William Glackens (1870-1938), Ernest Lawson (1873-1939), George Luks (1867-1933), Maurice Prendergast (1859-1924), Everett Shinn (1876-1953), and John Sloan (1871-1951). All of these artists are represented in the Hillstrom Collection, as are others of the associated Ashcan School, such as George Bellows (1882-1925), a favorite of Hillstrom, who collected several works by Bellows, including his 1922 oil painting Sunset, Shady Valley, recognized as one of the most important pieces in his collection. Through its ongoing acquisitions program, the Museum has expanded its collections from the core of donations from its namesake. It has acquired, for instance, additional works by The Eight and the Ashcan School, and by related artists associated with New York’s 14th Street School, artists of the American Scene, and others like Edward Hopper (1882-1967). In addition, artists of the Regionalist School of American art have been an important area of acquisition for the Museum. Thomas Hart Benton (1889-1975), John Steuart Curry (1897-1946), and Grant Wood (1891-1942) are all represented in the Museum’s collection, the latter by a complete set of all 19 of the artist’s lithographs. Don Myers walks through the Hillstrom Museum (Photo by Courtney Perry). Donald Myers ’83 serves as Director and Senior Curator of the Museum and has done so since its opening in 2000. Prior to returning to his alma mater, Myers served as a curator in the sculpture and decorative arts department of the National Gallery of Art in Washington, D.C., while also teaching art history courses at Catholic University. Myers also teaches classes in the Department of Art and Art History at Gustavus. 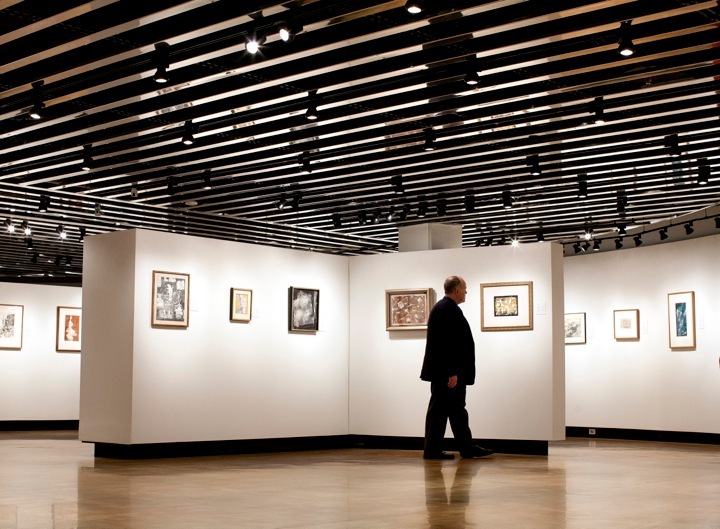 The Museum presents an ongoing schedule of temporary exhibitions of national, international, and regional artwork, art from the permanent collection, and also exhibits of student and faculty artwork. Notable past exhibitions have included 150 Years of Swedish Art: Highlights from the Swedish National Collections in Stockholm; Rörstrand: Swedish Art Nouveau Porcelain from the Robert Schreiber Collection; Marvels of Maiolica: Italian Renaissance Ceramics from the Corcoran Gallery of Art Collection; The Art Students League of New York: Highlights from the Permanent Collection; Rodin: In His Own Words, Selections from the Iris & B. Gerald Cantor Foundation; Migrations: New Directions in Native American Art; and Elmyr de Hory, Artist and Faker. The Museum is currently showing the exhibition Emergence—the 2014 senior art majors exhibition. 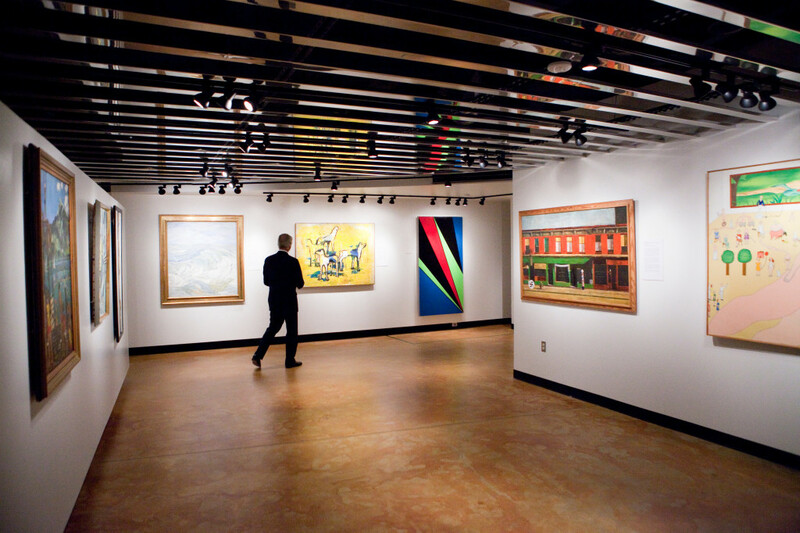 There is no charge to visit the Hillstrom Museum of Art. Regular hours for the Museum are weekdays, 9 a.m. to 4 p.m., and weekends, 1 to 5 p.m. For more information, visit the Museum’s website at gustavus.edu/finearts/Hillstrom.